Are the substances used in a particular task suitable for the task? Is the plant used in a particular task suitable for the task? Are the plant and substances suitable to the environmental conditions and terrain in which they are used? Are there any foreseeable abnormal situations which may arise, such as potential misuse of any materials or equipment and fluctuating operating conditions (e.g., during times of peak production)? Is there potential for injury from moving parts of plant or building fixtures, such as risks of entanglement, crushing, trapping, cutting, stabbing, puncturing, shearing, abrasion, tearing and stretching? Is there potential for injury due to manual handling forces used, such as lifting, pulling, pushing, holding, carrying and pressing? Is there potential for the generation of hazardous conditions due to factors such as pressurised content, electricity, noise, radiation, friction, vibration, fire, explosion, temperature, moisture, vapour, gases, dust, ice, or hot or cold parts? Could the failure of plant result in the loss of contents, loss of load, unintended ejection of workpieces, explosion, fragmentation or collapse of parts? Are there suitable safety devices and emergency back-up arrangements? Are current control systems adequate, such as guarding, power isolation, noise insulation and ventilation or fume extraction systems? Is there potential for falling objects? Is the condition, maintenance and repair of plant, equipment, building areas and fixtures adequate? Have the ergonomic needs of workers undertaking tasks (such as heights of work benches and adjustability of seating) been addressed? Have safer alternate means of carrying out the required task or achieving the required result been investigated and implemented? Do the location of plant, equipment, substances and fixtures impede work procedures? Have hazardous elements been segregated (such as electricity and water, and incompatible chemicals)? Has the potential for inadvertent movements or occurrences (such as accidental operation of plant) been accounted for? Are the current work systems (eg whether more or fewer people should be involved and whether work procedures need to be revised) appropriate? Do workers have the necessary skills and qualifications to carry out their work? 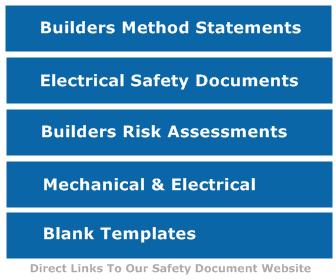 Have Method Statements and individual Risk Assessments been compiled? Are they the subject of briefings and toolbox talks?